Joshua Dysart is one of my favorite authors. I started following his work on the Captain Gravity mini-series from Pennyfarthing Press. It was a classic pulp story with a twist. I would highly recommend taking the time to track it down and read it. It also featured art by the talented Sal Velluto. I was surprised that this was published without much fanfare. Dysart also wrote “The Unknown Soldier” for DC that I have not gotten around to reading yet. Friend and fellow comic book fan Terry Kissinger was impressed with Dysart’s writing on it. Barry Kitson is a very good artist who has done numerous books for DC and Marvel. I especially remember his fine work on the “Legion of Super-Heroes” with Mark Waid. Put Dysart and Kitson together and you have a great comic. “Perfect Day” shows what happens after “The Harbinger Wars”. Our heroes won the battle against their nemesis (Toyo Harada) and are now relaxing in Los Angeles. For the first time everything seems to be going right for the group. As the story progresses we discover that things are not what they appear to be. Dysart has crafted a perfect story showing the heroes getting their just reward, then slowly the terror starts to build. Cracks appear that they cannot figure out. Whose “Perfect Day” is it? I do not want to give too much away. If you are considering buying a Valiant title, this is one of my two favorites (the other being “X-O Manowar”). 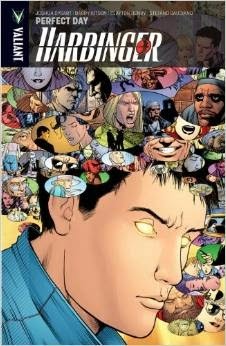 “Harbinger” should be at the top of everyone’s reading stack.